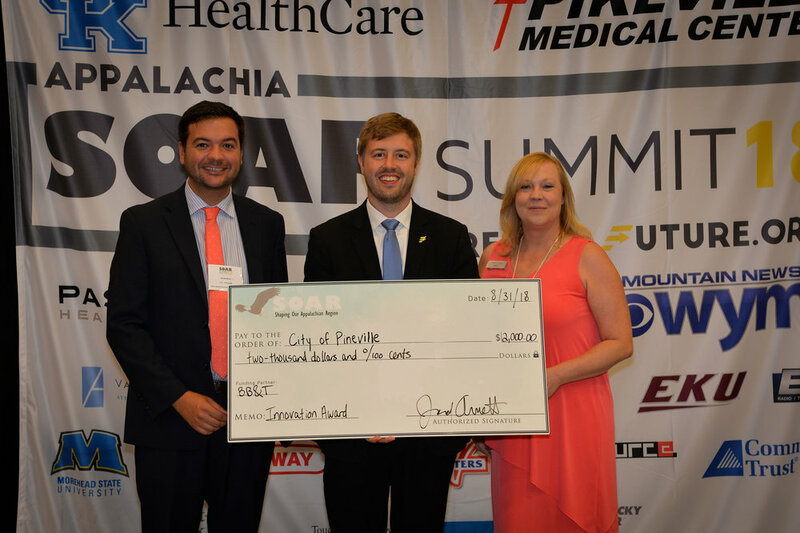 PIKEVILLE, Ky. – Shaping Our Appalachian Region, Inc. (SOAR) and BB&T presented innovation awards to projects throughout Appalachia Kentucky at the 2018 SOAR Summit on Friday, August 31 at the East Kentucky Expo Center. Arnett and Marlo Long, senior vice president for community development at BB&T recognized eight projects throughout the region. The City of Pineville and Pineville Main Street’s Courthouse Square revitalization project was the top award winner. Since 2014, the City of Pineville and Pineville Main Street have utilized a local incentive package to bring new investments to the city. They have specifically targeted the Courthouse Square district of Pineville. With the help of the incentive package, the Courthouse Square has 100% occupancy. More impressive, the incentive has resulted in $8 million in public and private investments to the city, as well as 200 jobs. Rustic Charm Farm | This Breathitt County farm breeds Nigerian Dwarf Goats and has an extensive line of goat milk products. The Hall Family have utilized technology to sell products both online and through Amazon. Rural Up! | The Rural Up! Coding Academy creates an exciting and engaging environment where middle school and high school students are challenged to think about technology in applicable ways. By giving them the information and resources needed for success in computer coding, Rural Up! is creating the high-tech workers of tomorrow, today. Kentucky Rail Heritage Center | This project utilizes current rail infrastructure and transforms a derelict tract of railyard in Estill County into a tourist attraction that has multiple economic drivers. The restoration and operation of historic steam locomotives will serve as an attraction, and when partnered with operational train excursions and integrated with regional career education programs, the 49-acre campus will be an area economic driver throughout Appalachia Kentucky. Owsley County Action Team | In 2016, the Owsley County Action Team and Teleworks USA, through partnerships with SOAR, the Eastern Kentucky Concentrated Employment Program, Inc. (EKCEP), Peoples Rural Telephone Cooperative, Owsley County Fiscal Court and Jackson Energy, opened the Owsley County Teleworks Hub. Since its opening, the hub has created more than 190 remote jobs and more than $4 million in annual new wages to the county. CMH23 | The idea of a collaborative marketing of tourism along the Country Music Highway, otherwise knows as US Route 23, was an idea that started at the very first SOAR Summit. A collaborative effort has resulted in a website (www.cmh23.com), a television channel, and hopes to partner with a national network to promote the talented musicians and vocalists and natural beauty of eastern Kentucky. Sister Cities (Prestonsburg and Beattyville) | The Sister Cities project is a collaboration between the cities of Beattyville and Prestonsburg and started in March 2018. As partner cities, Beattyville and Prestonsburg have held several business collaboration meetings and visits between the two cities, its business owners and leaders. Visits included touring each city’s business district. This collaboration has sparked many new ideas and synergy, as well as given business owners networking opportunities to collaborate, sell new products, and find innovative ways to overcome challenges. Essentials for Santa | Essentials for Santa is a community service project founded by Duff-Allen Central Elementary School student Todd Prater. For the past two years, Prater has collected pillows, blankets, and hygiene items during the months of October and November. Those items are then distributed to underprivileged children at the Dumas Rescue Christmas giveaway in Floyd County. For more information on SOAR, visit www.thereisafuture.org.